I can no longer call myself a daily outfit blogger, as I've been neglecting my blogging duties as of late. My work load has increased; I'm exercising and cooking more; making my new house a home & spending my free time with loved ones (and my latest addiction, American Netflix!) I've always struggled with the concept of relaxing & down time, but 2013 is shaping up to be the year of balance and I couldn't be happier. That means I'll probably see less of you here at Tinfoil Tiaras but I'll still make sure to pop in and say hello when I get the chance! What is your 2013 shaping up to be? Balance is good! If you're finding a routine that works for you, then that is awesome! 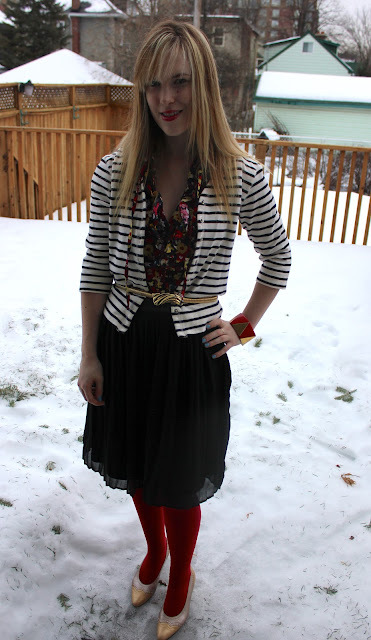 Love the floral shirt and striped blazer - fun pattern mixing! 2013 is shaping up pretty good so far! I'm taking life one day at a time and it works well for me! Blogging is supposed to be fun, and rigidly sticking to a schedule can quickly make it seem tedious. I'd rather see you post here when the timing is right for you and when you have something interesting to say (or wear!). We should all be working on balance this year. It's totally okay to be a fairweather blogger. You just bought a house so I would definitely be channeling my energies there. I call it domestication :) Cooking, cleaning, organizing, etc. Life does have a way of getting in the way of blogging, doesn't it? But, I say that's okay. Because it happens to all of us. Finding balance is key - as long as you're happy, it's all good! Glad to hear you are getting you time. I going to be step away from my blog to due to something big that is coming. Which I can't say what it is yet. If you're happy... well, I won't be happy not seeing you... but I can be happy for you! But I get it... I struggle to pre-post on weekends (that is, write the posts for the week), even though I'm down to 3 days a week. And since it's so close to bedtime, you can tell that even visiting blogs is hard to fit in! Don't you just love when you're living a full... and balanced... life!?!?! my 2013 has been pretty much insane too. I didn't even notice where January went. I just have so much work to do. some days I simply dream about my first vacation this year but it's so far away right now..
anyway, your outfit. I love the layering and all those golden accents here and there. When I saw you post less often, I smiled because I guessed your real-life got more interesting (and demanding). That happens. When I met you, you seemed poised for an exciting career and personal life. Glad to see you in the midst of it. BTW, I love your taste in clothing. Your outfit is so pretty. I love your floral top. And it looks great paired with the striped cardigan. I am one of those people who struggle with finding a balance as well so I am happy that you are getting to relax more. I think it's wonderful that you're actively seeking out balance Emily. One of the big changes I've made recently is to do my blog reading in one shot on the weekend. I find it more manageable with my day-to-day life, and it gives me something extra to get excited about on the weekend. These patterns mix so nicely. I'm a sucker for stripes + abstract prints in primary colours. The gold is a great accent metallic. I completely agree with you Em...finding the time to balance life and blogging can be difficult but i like your new approach! I think it would be really hard to be a daily outfit blogger, especially on crazy busy days. It's completely understandable you want to cut back and blog when you feel like it and have time. Bloging is suppose to be fun! I'm like Kat, I usually do my blog reading & commenting on Sunday & Mondays, makes things way easier and I look forward to my chill out time.